Join Canada's largest public advocacy group! Your contribution of $10 or more entitles you to a one-year membership as a Council of Canadians Supporter! 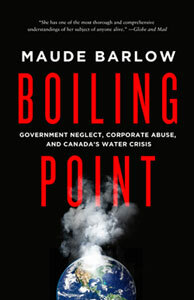 Start a monthly gift of $10 or more and we’ll send you a free copy of Maude Barlow’s latest book on Canada’s water crisis, Boiling Point. Prefer to donate by phone? Call us toll-free at 1-800-387-7177. Due to our political work, the Council of Canadians is not a registered charity. We are unable to provide charitable receipts for donations. The Council of Canadians is Canada’s leading grassroots social action group. For 34 years our work has remained 100 per cent independent and funded by generous donations from people like you. We do not accept corporate or government funding, and never have.